The Michigan Silverback: Mama Mia! I have always been an unabashed and shameless promoter of the Martha A. Kent fan club. Leave aside for a moment that this magnificent woman was, is, my mother. This lady is the very exemplar of The Greatest Generation. Bearing and raising nine only children (you have to know my sibs and me well to get that joke) and raising them, most of the time, on a single salary (my dad's), she was a pioneer: first woman manager at Hudson's Corporation during WW2, a TV writer in the days of rabbit ears and static, an industrial filmmaker who (a) made dozens of training videos for the auto industry almost singlehandedly, and (b) witnessed Gov. Dukakis make the tank ride that tanked his presidential campaign in 1988. 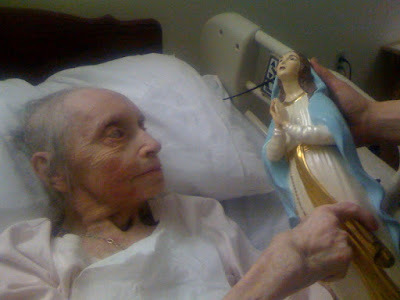 Mama is in her 88th year now, and is in a nursing home: her mental faculties are 100% there, but she's confined to bed; she cannot even walk any more, and her hands barely function. This picture, however .... reflects an extraordinary moment. Mom inherited her mother Loretta's glass sculpture of the Blessed Mother when Grandmother Remski died in 1976. Unfortunately, it went the way of all statues of Mary last September when a well meaning but inattentive assistant at her nursing home knocked it to pieces by accident. Well, Mom got her back yesterday in one piece after some of the fam passed the hat and sent it to a glazier's for restoration. The result was this picture. I thought you'd all appreciate it. Awesome does not begin to describe this lady. Truly.